Click the link below for the page containing a complete list of replacement parts for the ResMed Ultra Mirage full face mask. Great service, I will be ordering again. Everything is great and just like new! Exactly the right part quickly shipped! 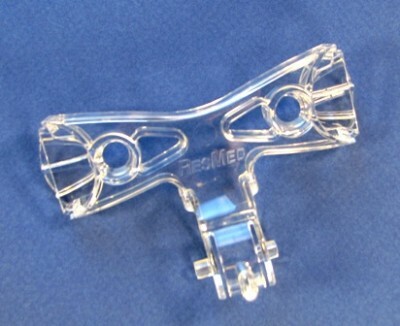 Great replacement piece for a poorly designed hinged CPAP forehead bracket. The hinges break, but the new replacement snapped in and works perfectly. Perfect fit, solved my problem. Responsive customer service. Received my replacement part quickly, perfect replacement. The forehead support was exactly what I ordered and came within a few days. I thought the price was very reasonable. Product arrived extremely fast and just as advertised. Excellent worry free transaction. This is a very very poor design. I truly am surprised the Dr's are still recommending Resmed. This specific piece is the week link. It's not a matter of if it will break, it's just a matter of when. I will say it's cheap enough to replace which is good, because you will have to often. I would go with a different brand if you can. First off let me say that "bestcpaprice.com" is 100% professional. I order, I get the item in a few days. Always promptly and shortly after ordered. This item on this mask is a weak spot. I have replaced 2 of them and replaced the mask a few times. I bought this to fix my backup mask. I use the ResMed Quattro Air and much prefer it. It is less bulky, lighter weight and just simpler. The Ultra Mirage is good tho. Bulky and works well but seems to have a lot more hardware on my face when sleeping compared to the Quattro Air. I could not have been more satisfied with the customer support received during initial inquiry, ease of ordering and quick delivery. As always, great pricing and very efficient processing and delivery. The replacement part for the facial mask was received in a very timely manner and was quickly installed on the mask. Part arrived quickly and was a perfect replacement fit. It was the lowest price on the internet by at least $3. I will purchase from this company again. I couldn't be happier with the way my order was handled. It took only a few days to get parts for my mask. I'm absolutely certain that I'll be ordering all of my CPAP supplies from BestCPAPprice from now on. Bought two cause they break often. Not BestCPAPprice's fault. Just poor design on that part. Unfortunately I'm hooked on the Resmed Mask. Service and prices from BestCPAPprice are the best. Great service received the product two days from the time I placed my order.One other thing they had the best price for everything.